Air pollution in Toronto. Photo credit: Flickr/ United Nations Photo. Delegates and advisors meeting in Bonn, Germany are hard at work hammering out the fine print for the Paris Agreement Rulebook, and a particular focus has been placed on deciding how Articles 4 and 6 will play out as the agreement comes into force. These two articles are important because they outline rules to ensure environmental integrity in emissions reductions, particularly when nations are cooperating with others to cut emissions together, likely through international trading. Trading is an important tool in the effort to limit temperature rise, as it can lower the overall cost of reducing emissions, potentially increasing the ambition of the world’s greenhouse gas targets. Nonetheless, having a strong standard in place to ensure that all trades of emissions reductions are high-quality and transparent is important to prevent “double counting” or “double claiming.” This refers to a situation where emissions are reduced in one nation, traded to another to offset emissions increases, but are still claimed by the issuing nation when reporting on their own emissions cuts. If the Article 6 rulebook were to allow such double claiming, it would make it seem like we are getting twice as many emissions reductions as actually happen – and that would be bad news for the climate. While Articles 4 and 6 have text to help prevent that, their focus on sectors that are covered within each nation’s “Nationally Determined Contribution” (NDC) has led some to suggest that double claiming need not be a concern if it occurs for reductions outside NDCs. Nonetheless, other provisions of the Paris Agreement, like Article 13, require Parties to develop a transparent accounting framework to track how their efforts are contributing to the goal of limiting warming to well below 2 degrees Celsius—which could very well apply to reductions in non-NDC sectors too. In that context, it is important to consider the question: What share of the world’s emissions occurs outside of NDC coverage? Even if emissions are covered under NDCs, are there certain types of NDC targets that still leave covered emissions vulnerable to double counting? How should the rulebook best account for this risk, given the Paris Agreement’s pre-existing integrity requirements? EDF set out to answer these questions with a preliminary analysis to assess the overall share of the world’s emissions that are at risk of double counting—and we found it could be over a third of the world’s total emissions. That’s about as many emissions as from China and the US put together. The study is a two-part process. First, we interpreted NDCs using a standardized classification system that determined what share of each nation’s emissions could reasonably be considered “covered” under their NDC. Second, we crafted four different scenarios that assessed the risk profile of different shares of the world’s emissions, based on a set of assumptions that ranged from optimistic to conservative. In our scenarios, we vary the types of NDC targets that can be considered stringent enough to ensure that emissions covered under their scope will not be double counted. In our category 1 scenarios, all target types are eligible; in the category 2 scenarios, only mitigation targets with a quantifiable cap on emissions are considered. China and India also have assumptions that differ across scenarios. They are treated separately from other large emitters due to the fact that their mitigation targets are intensity-based (measured relative to units of GDP), rather than compared to a base year or baseline scenario level of emissions. 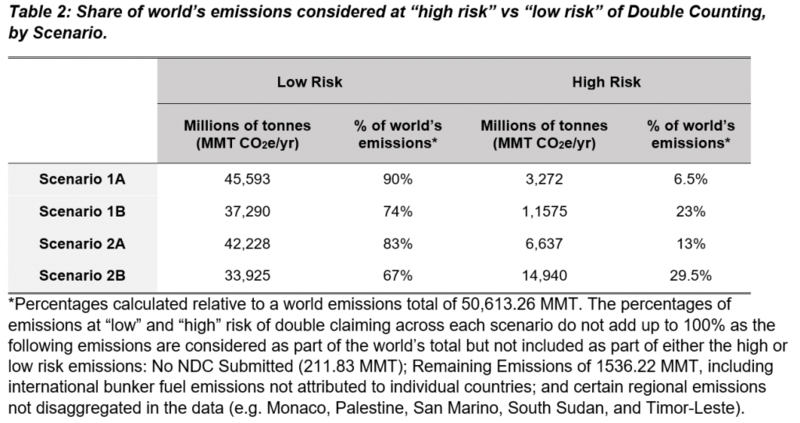 In all scenarios, the share of the world’s emissions at high risk of double counting was substantial. Even in the most generous scenario where all types of NDC mitigation targets were considered to entail low risks of double counting, we found that 6.5% of the world’s yearly emissions were at high risk of double counting—more than all of India’s emissions put together. Our most conservative scenario painted a much starker picture, with about a third of the world’s emissions considered at high risk of double counting. The estimated share of world emissions that could be at high risk of double counting rises even higher if only parties to the Paris agreement are taken into account. According to our estimates, nations who are not Parties account for about 5 gigatons of greenhouse gas emissions (that’s about 10% of world totals). If we assume these emissions are also at high risk of double counting, given the fact that they don’t benefit from the same standards placed upon emissions exchanges as those that are governed by the Paris Agreement, the total volume of high risk emissions could range as high as 39.5% of world emissions. In reality, emissions reductions are only at risk of being double counted if there is demand for them, and international emissions markets are still at a nascent stage. Still, coming years could bring a spike in demand for carbon credits—nearly half of the world’s nations have expressed interest in using either domestic or international market mechanisms to meet their NDC goals, and the scope of carbon markets is rising worldwide. With more opportunities to benefit from carbon trading comes a greater incentive to double count—but only in the absence of high quality standards on such exchanges. These results indicate that the stakes are high, and parties should take every effort to ensure that double counting risk is proactively taken into account, both within and outside of NDCs, when designing the rules that nations will abide by for years to come. This post was updated on May 16 to add a reference in the second paragraph to an analysis about the potential for emissions trading to reduce emissions and increase ambition, as well as an updated headline.